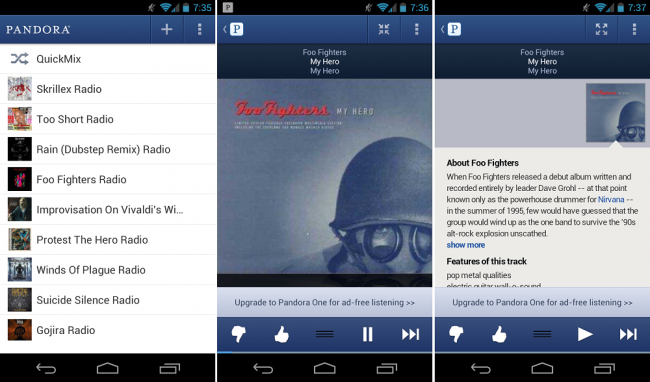 Lovers of music can go pick up the newest version of Pandora that recently hit Google Play. Inside the update, you will see a lovely UI overhaul, which should allow for much easier navigation throughout the app. Along with the overall new look, finding information on the artists and songs you love should be better than ever. With the ability to see artist bios, song lyrics (so you can sing along in the shower), and find similar artists, this is easily the best Pandora update yet. Although, I have found one issue. I myself am not a premium subscriber and those pesky banner ads pop up literally every 30 seconds during song play. That’s a pain. Either way, go check it out and let us know what you think. Do you use Pandora or another music streamer such as Spotify or Slacker?